The Annual World Pumpkin Weigh-off to Highlight this Weekend’s Fall Festival at the Great Pumpkin Farm. It’s that time again – when we’ll find out if anyone has grown a world-record-setting pumpkin! Some of the area’s – perhaps the world’s? 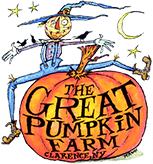 – heaviest pumpkins will be at the Great Pumpkin Farm in Clarence this weekend as the annual World Pumpkin Weigh-off will be held on Sunday, October 1 beginning at 12:00 p.m.
Karl Haist of Clarence Center, NY has won the Weigh-off the last two years; his first-place pumpkin last year weighed 1964.5 pounds! Can that number be topped this year? Will one of the entries be large enough to set a world record – and take home a $10,000 cash prize? The Great Pumpkin Farm had the first 1,000-pound pumpkin at the 1996 Great Pumpkin Farm Fall Festival – 1,061 pounds – and it went right into the Guinness Book of World Records. Since then, there have been many pumpkins entered in the Weigh-off well over that weight. What will this year bring? Winners will be announced Sunday as soon as all entries are officially weighed in. The owner of the largest pumpkin at the World Pumpkin Weigh-off will take home the top prize of $5,000, (with the chance to win twice that amount and earn a world record if his or her pumpkin weighs over 2,000 pounds). Cash prizes will also be awarded for second through sixth place. For more information, including rules and a list of previous years’ winning entries, visit World Pumpkin Weigh Off. Erie County Sheriff’s Canine Demonstrations Learn how the K9 team apprehends suspects. Watch as they demonstrate their explosive detection skills. Demonstration times Saturday only are at 1:00 p.m., 2:00 p.m. and 3:00 p.m.
Sylvia Fletcher & Friends starring in Ventastic! This comedy ventriloquism show takes place both days at 12:30, 3:00 & 4:30 p.m. and is free with Festival admission. Magic by Mike & Annie This magic experience is full of comedy and audience participation opportunities. Show times Saturday and Sunday are 11:30 a.m., 1:00, 3:00 & 4:30 p.m. in the Pumpkin Palace (next to the Cackling Hen Revue). Free with Festival admission.